I designed this modern Hexagon Handbag for Stitch Spring 2014. It is a big bag, perfect for sewing projects or just if you like big handbags like I do! The fabric with the "lady" and "vintage household items" are from Melody Miller. I love her fabric and have been a fan for quite some time. Her fabrics have the most wonderful motifs and are perfect for fussy cutting. Sew me a Song has some of her fabrics here! 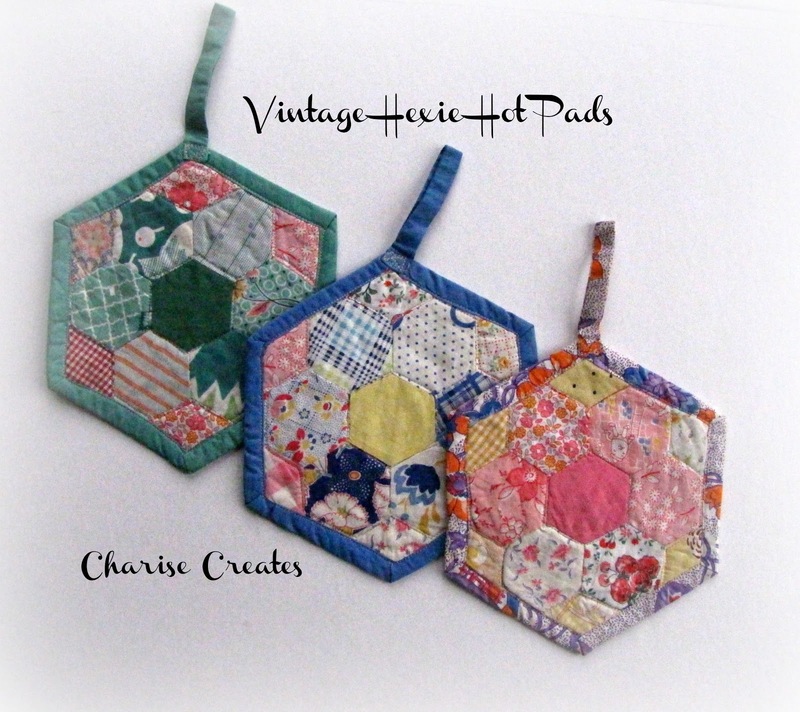 My first hexagons were hand stitched, like the ones used for my hexagon pouch. which inspired my modern version - a Mother's Day gift for my mom. 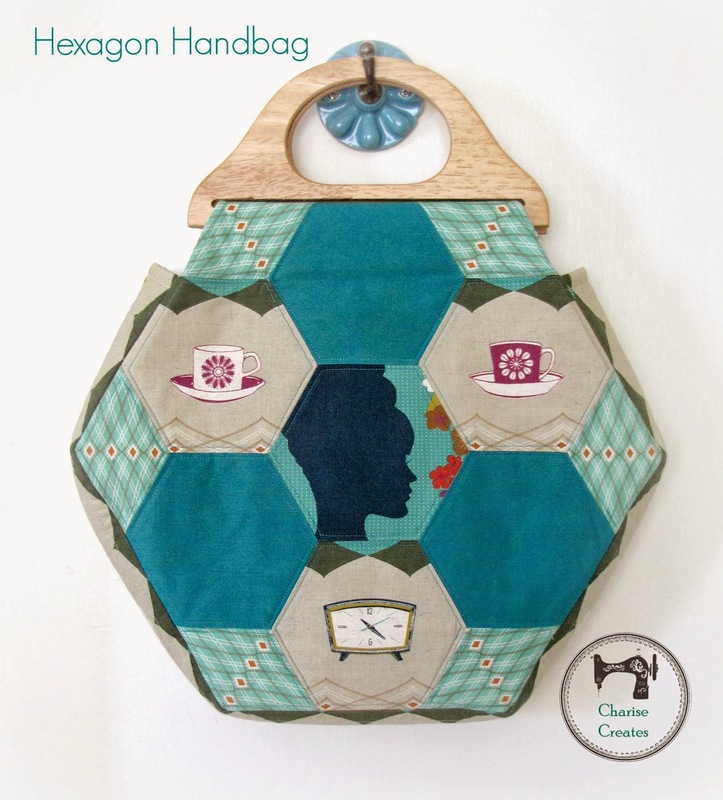 I recently took a wonderful class for machine stitching hexagons from Katie Pederson, Quilting Modern author, which inspired my machine stitched hexagon projects including the Hexagon Handbag and machine stitched hexagon placemats, pictured above. Happy Valentine's Day! I am sneaking this pic in of my hubby and me circa 2000. I met this wonderful man on Valentine's day exactly 15 years ago!! I am so lucky to spend each and every day with him! 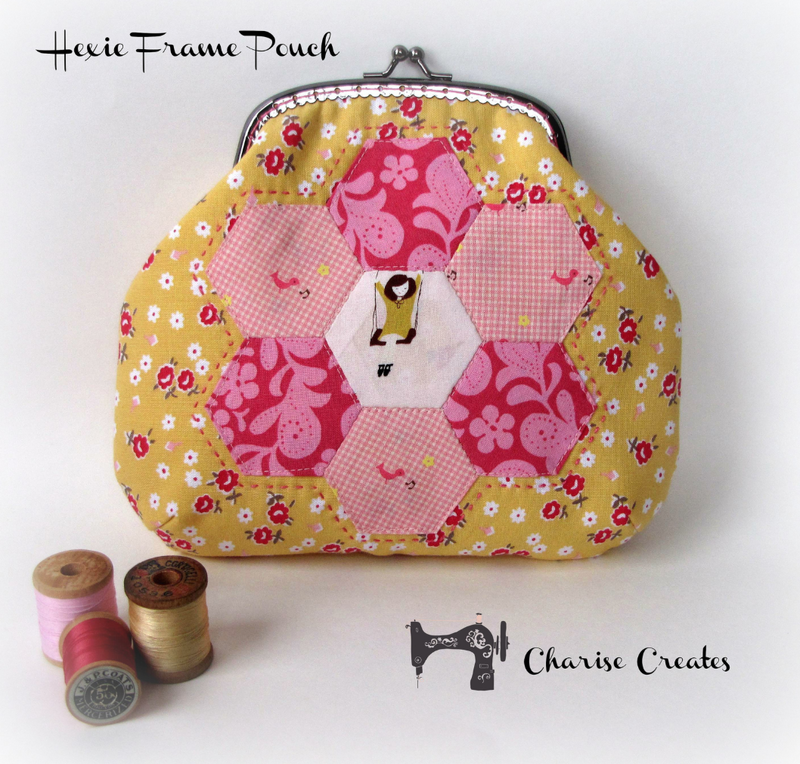 Charise, your hexie bag is just wonderful! I love your design, how the upper hexies make the connection with handles (I hope you understand what I mean, it's hard to describe it in English:). Gorgeous bag!! 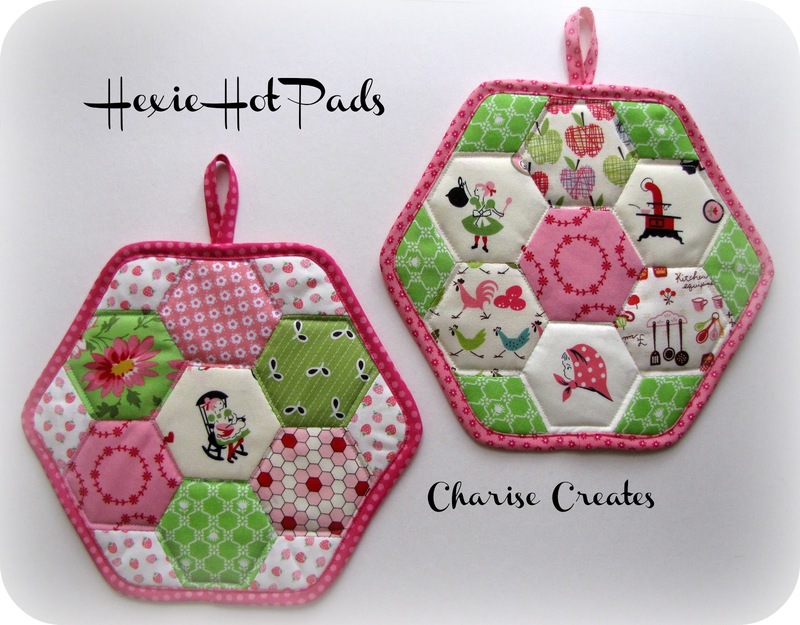 I love hexies and have been in hexie heaven foe about 2 years now. I have made about 6 bags all from hexies so far using the pattern found in the book Sew by Cath Kidston, all using EPP though. I haven't had a go at machining them yet. Your handbag and potholders are adorable! Congrats on your 15th anniversary of meeting your hubby! How neat that you met him on Valentine's Day! Fun bag too! I like the handles you found. 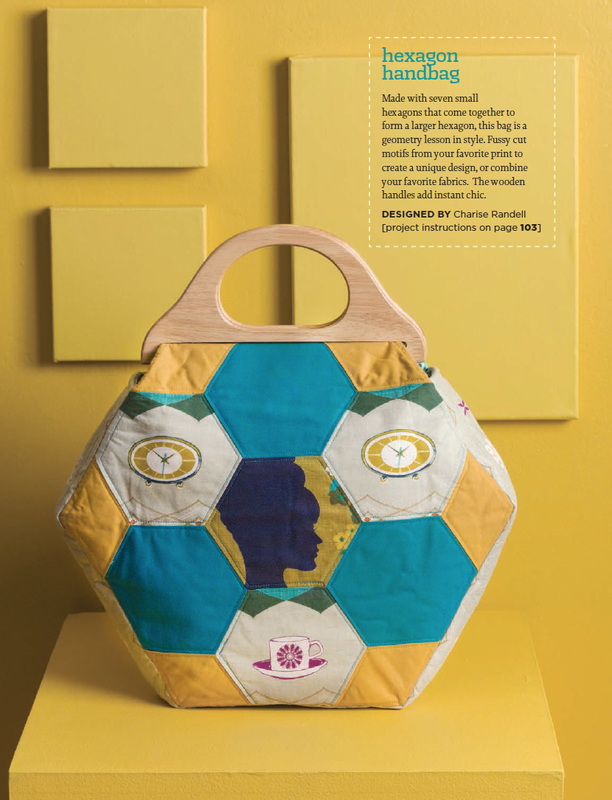 Love that bag and the size of the hexagons are perfect! I've done a few smaller hexagon projects by hand. Doing them by machine must be a dream ~ I'm going to be on the look out for the Spring edition of Stitch!!! Cute photo of you and your guy! I have not done much with hexies but this project tempts me to give it a try. Your photo of you and your hubby is a nice one.